Vivekananda Kendra Shimla celebrated Gurupoornima on 17th July 2016 by children of Samskar Varga and Anandalaya. 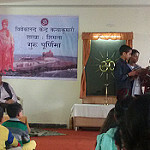 Children presented Guru-Bhajan, Patriotic Songs, Yogasana Demostration, Drama on Guru-Shishya and Sanskar Varga. Prof Omprakash Saraswatji was the chief guest in the program. About 40 people took part in the programme. Second program was organized in Sanjoli Collage (Center of Excellance) on 19th July 2016, over there cheif guest was Prof R N Mehta, retired principle of Evening Collage. He highlighted the relations of Swami Vivekananda and Sri Ramkrishana Paramhansa in his lecture.